Montenegro with its capital Podgorica is located in Europe (Southeastern Europe, between the Adriatic Sea and Serbia). It covers some 13,813 square kilometers (slightly smaller than Connecticut) with 642,550 citizens. Serbian, Hungarian, Bosnian, Albanian and Croatian are the languages commonly used by the people in Montenegro (consider regional differences). Albania, Bosnia and Herzegovina, Croatia, Kosovo and Serbia are bordering countries. Montenegro is a country in the Balkans, on the Adriatic Sea. It borders Croatia and Bosnia and Herzegovina to the north, Serbia to the northeast, Kosovo to the east, and Albania to the south. To the west of Montenegro is the Adriatic Sea. Although Montenegro's magnificent sea side scenery is best known among travellers, it's mountainous inland has some grand panoramic views to offer, too. The country shares the large freshwater Lake Skadar with neighbouring Albania. It has National Park status and offers great opportunities for hiking, bird watching and wildlife spotting. Of the many friendly fishermen's towns around it, Virpazar is the most convenient one for travellers. A real must-see is the splendid Tara River Canyon, with its steep banks rising up to 1300 meters above the River Tara waters. It's the second longest canyon in the world and a UNESCO World Heritage Site. The landscape is highly indented coastline with narrow coastal plain backed by rugged high limestone mountains and plateaus. The average density of population is about 47 per km². The climate in Montenegro can be described as Mediterranean climate, hot dry summers and autumns and relatively cold winters with heavy snowfalls inland. Potential threats by nature are destructive earthquakes. To reach someone Montenegro dial +381 prior to a number. The local cellular networks are operated on 900 MHz, 1800 MHz, 3G, 4G. Websites typically end with the top level domain ".cs". If you want to bring electric appliances (e.g. battery chaarger), keep in min the local 230 V - 50 Hz (plugs: C, F). The sign for the locally used currency Euro is EUR. 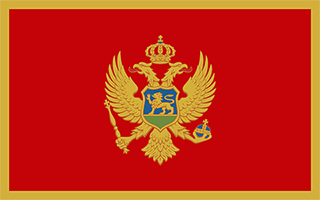 A red field bordered by a narrow golden-yellow stripe with the Montenegrin coat of arms centered; the arms consist of a double-headed golden eagle - symbolizing the unity of church and state - surmounted by a crown; the eagle holds a golden scepter in its right claw and a blue orb in its left; the breast shield over the eagle shows a golden lion passant on a green field in front of a blue sky; the lion is a symbol of episcopal authority and harkens back to the three and a half centuries when Montenegro was ruled as a theocracy.